This lady bird was found hunting aphids on Gooddings Willow along Mesquite Wash in Maricopa County, Arizona on 19 April 2008. This fierce predator of plant-feeding aphids has been widely introduced around the world from its original home in Europe. Here in the Sonoran Desert it is frequently encountered along riparian habitats where they hunt especially on foliage of trees. Notice the two white splotches on either side of the pronotum (the first segment behind the head), three black spots on each elytron plus one in the middle. Ladybirds are also commonly known as ladybugs, but because they are beetles most entomologists avoid this name. In beetles the first pair of wings is hardened into a shell (elytra or elytron (singular)) of sorts that can be folded out to reveal the more delicate flight wings beneath. Beetles differ from bugs also in that they have four distinct life stages: egg, larva, pupa and adult. 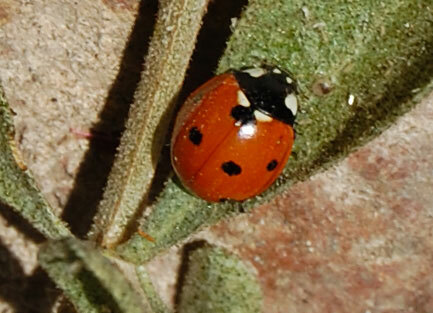 Both adult and larva Seven-spots eat aphids and other small insects and insect eggs. Copyright Michael J. Plagens, page created 25 April 2008.